As a high school athlete, Dr. Mike was sidelined by a herniated disc. Unable to even put his shoes and socks on because of the pain, he went to a chiropractor, who resolved his injury. When it was time to explore colleges, he visited Palmer College of Chiropractic in Davenport, Iowa. 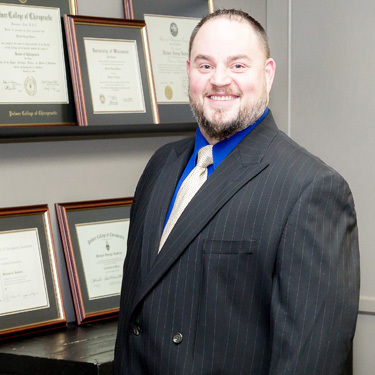 Dr. Mike earned a Doctor of Chiropractic in 2005. Since then, he has honed his skills in a variety of techniques such as Thompson, Diversified, Gonstead, Activator®, extremity adjusting and applied kinesiology. Each patient of Dr. Mike’s is treated uniquely with what suits their needs. The most common conditions he treats include back pain, neck pain and headaches. When he isn’t seeing patients at The Connection a chiropractic place in Winona, Dr. Mike likes to spend time with his wife Jamie, son Colton, daughter Aubreigh, Gordon Setter Brody and extended family back in Wisconsin. He enjoys camping, taking his son fishing and his daughter to her gymnastics practice. An avid sports fan, he roots for the Brewers and Packers. Contact us today to schedule your first appointment! Convenient late opening hours are available.